Why Eat Plant Based ? How to Start a Plant? Do You Need to Lose Weight Signs That You May? Preheat oven to 200C/180C fan-forced. Put potatoes on a baking tray. Drizzle with oil. Season with salt and pepper. Bake for 45 minutes or until tender. Set aside for 5 minutes to cool slightly. Increase oven temperature to 220C/200C fan-forced. Meanwhile, heat a small non-stick frying pan over medium-high heat. Add bacon. Cook, stirring, for 5 minutes or until golden and crisp. Transfer to a bowl. Stir in chives. Cut a slit down the length of each potato, leaving the base intact. Carefully scoop out centre flesh, leaving a 1cm-thick shell on each side. Place potato flesh in a bowl. Season with salt and pepper. Mash with a fork. Stir in sour cream, 1/3 cup cheddar and 2/3 of the bacon mixture. Spoon filling into potato shells. 4 Return potatoes to baking tray. Bake for 8 to 10 minutes or until heated through. 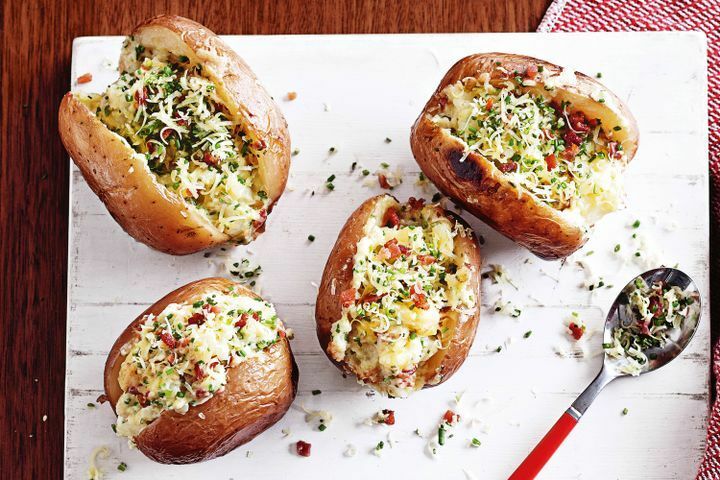 Serve potatoes sprinkled with remaining cheese and bacon mixture.